Propolis is quit a popular ingredient in skincare, its known for its antibacterial and anti-inflammatory properties. Propolis also called 'bea glue' is a resinous mixture gathered by bees from treebuds, flowers, and other botanic sources. It has been used in traditional Korean medicine for centuries. I'm not sure about western brands but in the Kbeauty world its a big ingredient, you will find it in ampoules, essences, sheet masks and even in cosmetics. 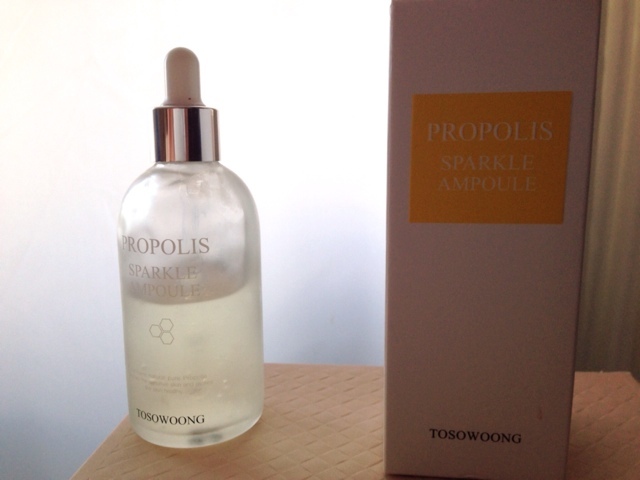 I always make sure to use at least one propolis product in my skincare routine, one of my current favorites is the Tosowoong Propolis Sparkle Ampoule. 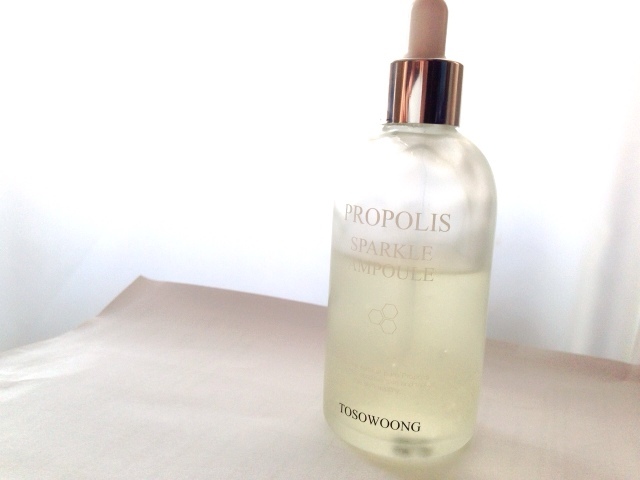 The Tosowoong Propolis Sparkle Ampoule contains 80% propolis extract, honey extract and various plant extracts. It promises to add shine, glow and moisturize your skin, improve elasticity and radiance. Cosdna analysis shows no red flags, expect the usual butylene glycol and dimethicone ranked 1 for acne. The first ingredient is our propolis extract, 80% is quit good, like always we don't know how much is actually pure propolis in the extract. As already mention before propolis can have many benefits, getting rid of blemishes healing acne scars, improving skin hydration. Also coming from our little flying bees is the honey extract, good for intense hydration (humectant), and calms down skin irritations. Further, there are many plant extracts and oils, some are there for fragrance but I assume that most of them have skin benefits such as hydration, anti-inflammatory, soothing etc. 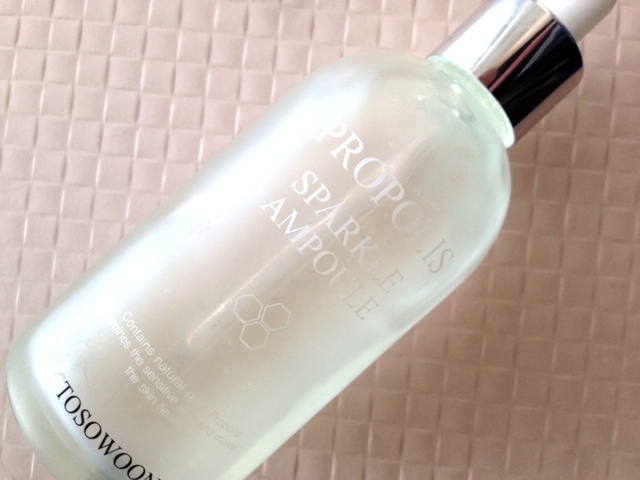 The ampoule comes in a heavy frosted glass bottle with a dropper dispenser. It looks very elegant and chique, I really love the design. The bottle has 100ml of product! !, so its a lot for an ampoule, for comparison LJH Propolis ampoule is 15ml. 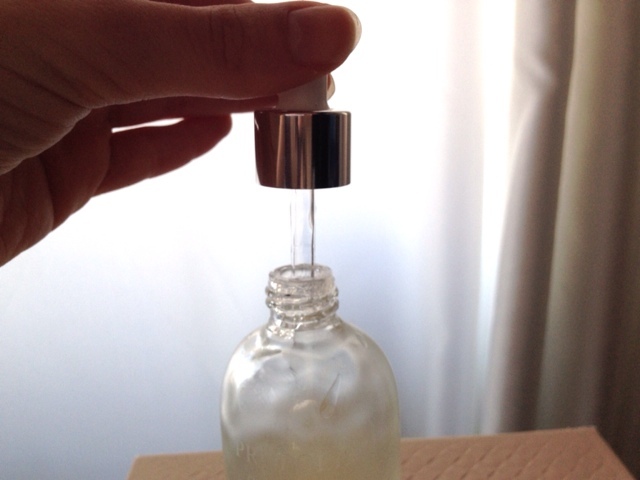 I apply 3-4 drops of the ampoule after an essence or a serum, depending on the consistency of the previous products. You just let it absorb for a minute or so and then follow with a a serum or emulsion. The fact that it is a dropper applicator makes it very easy to use, its also hygienic and you will never use to much product. Absorption rate is okay, its not as fast as with other ampoules, because its quit hydrating. There is a sticky feeling afterwards, but it will disperse in a few minutes. 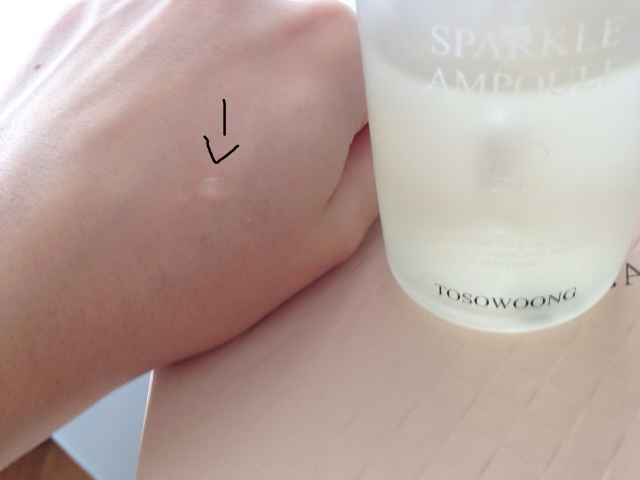 Its not as liquid or runny as other ampules, the texture is more gel like and there is a light yellow color to it. The smell reminds me of citrus, maybe lemon and honey, I personally like it, but if your are allergic to fragrance or just don't like scents in skincare then this might be a turn off. I have been using this amploule for over 3 months now, as you can see there is still a lot of product left. 100ml is really a lot, thanks Tosowoong for not giving us 30ml for the same price. When I first introduced this product into my routine, the first thing I noticed was the glow, my skin was more glowy and moisturized. Yes, its really moisturizing, its probably one of the most moisturizing ampoules I have ever tried before. If you have dry skin, or dehydrated like me then I guess its perfect. For oily skin this might be to heavy, the plant extracts and oils could be to much. Still, my tip; even if you have oily skin try to use oil cleansers, products with natural oils and even face oils to regain that oil balance in your skin barrier (did work for me, although my skin is dehydrated - acne prone). Honestly, at the beginning I was afraid my sensitive skin would react badly, there were so many plant oils and extracts, I was cautious. I'm happy to tell you, my skin likes it. Its gentle, very hydrating and seems to reduce acne, aids in healing and prevention. Works good on my dehydrated, sensitive and acne prone skin, makes my skin glowy, moisturized, and helps with redness and blemishes. If you have dry skin or dehydrated like me then I would say its definitely worth a try. I wouldn't really advice it for oily skin types out there. If you have oily skin and still want to try it, then maybe you can mix it together with some other cream or emulsion, that way you will get some benefits form it without the glow and moist. I still cant believe how price friendly it is, you get 100ml of a 80% propolis ampoule for around 30$. I purchased mine from Wishtend* for 29$. Its also available on /Peach&Lilly 29$/ Testerkorea 36$ (it says 90x seems to be a new version..? )/ Yesstyle 28$/ Cupiddro 29$. *This post contains some affiliate links (with an asterix) shopping with them will help support the blog. It is :) definetly worth a try. What kind of skin type do you have ? Thank you so much for this review! I've been looking for a new product to add to my regime. Wow, this looks a very effective ampoule. I must try it for sure. Thanks for the review.